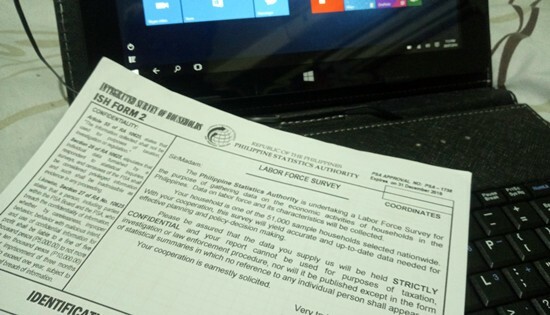 TACLOBAN CITY – The Philippine Statistics Authority (PSA) seeks support for the July Labor Force Survey (LFS) and the 2018 Family Income and Expenditure Survey (FIES) which will be conducted simultaneously starting July 9, 2018. A total of 10,866 systematically and randomly selected sample households in Region VIII were identified as respondents. Around 427 Hired Statistical Researchers will be deployed across the region to conduct the interviews. The LFS is a quarterly nationwide survey of households which aims to gather data on the demographic and socio-economic characteristics of the population, and to provide a quantitative framework for the preparation of plans and formulation of policies affecting the labor market. Specifically, the LFS serves as a tool in measuring the distribution of household population 15 years old and over by employment status – employed, unemployed or underemployed. It is also used to determine various employment characteristics such as industry, class of worker, nature of employment and basis of payment. The 2018 FIES, meanwhile, is a nationwide survey of households conducted every three years, which aims to gather data on family income and expenditure, to include among others, levels of consumption by item of expenditure as well as sources of income in cash and in kind. The results of FIES provide inputs in the estimation of poverty threshold and incidence. It also determines the levels of living and disparities in income of Filipino families, as well as their spending patterns. The PSA appeals to the public to cooperate and support the conduct of these surveys. The office also assures that all information gathered will be held strictly confidential and shall not be used as evidence in court for purposes of taxation, regulation or investigation as provided for in RA 10625.Data generated from these surveys will be disseminated in statistical summaries without reference to any individual person or household.